A nuchal cord is a complication that occurs when the umbilical cord wraps around the baby’s neck one or more times. This is common and occurs in about 15 to 35 percent of pregnancies. Often, nuchal cords do not impact pregnancy outcomes. However, certain types of nuchal cords can pose a significant risk to the baby. Nuchal cords can interrupt normal blood, nutrient, and oxygen exchange. This can lead to a variety of birth injuries, including hypoxic-ischemic encephalopathy (HIE), a form of brain damage caused by oxygen deprivation around the time of birth (1). If a nuchal cord is present, doctors should carefully monitor and manage this condition. In some cases, babies with a nuchal cord may still be delivered vaginally (there are specific maneuvers that can help to prevent complications). However, there are circumstances under which a C-section or emergency C-section is necessary (2). It is paramount that the medical team handling a pregnancy be skilled in handling complications like nuchal cords. It is medical negligence if doctors do not monitor and treat the mother and baby properly, or do not follow standard of care. If the baby is injured, this is medical malpractice. A nuchal cord is a common but potentially dangerous complication in which the umbilical cord wraps around the fetus’ neck. What is a double nuchal cord? A double nuchal cord occurs when the umbilical cord wraps around the baby’s neck two times. This is also relatively common, occurring in about two-seven percent of births. It is also possible for a nuchal cord to be wrapped more than twice. Even when the cord is wrapped multiple times, the baby may still be born healthy. However, babies with multiple nuchal cords may be at a slightly higher risk of complications such as impaired fetal growth and fetal heart rate abnormalities (1). Can the umbilical cord strangle the baby? Although rare, the umbilical cord can ‘strangle’ a baby by cutting off oxygen flow through the neck to the brain. This may involve compression of the carotid artery. 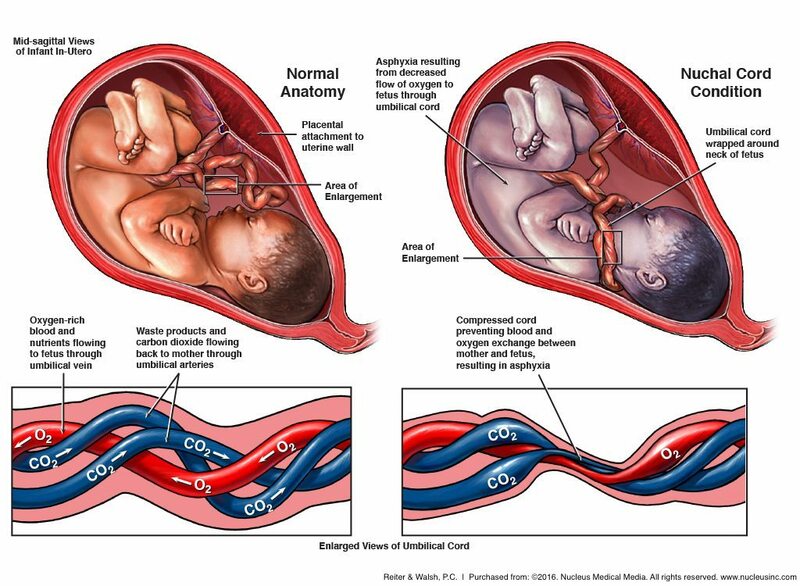 Additionally, the umbilical cord may become compressed against itself or the fetal neck, which reduces the flow of oxygenated blood through the umbilical cord. This can also be very dangerous to the baby (1). The umbilical cord is responsible for supplying the baby with oxygenated, nutrient-rich blood, and carrying deoxygenated, nutrient depleted blood back to the placenta. If a nuchal cord interferes with these processes by compressing the umbilical cord, or restricts arteries and veins in the fetal neck, this can lead to birth asphyxia (fetal oxygen deprivation). The likelihood of birth asphyxia and other birth injuries is influenced by the type of nuchal cord. Type A Nuchal Cord: When the end of the umbilical cord connected to the placenta crosses over the end connected to the baby. This may be called an “unlocked” nuchal cord, and is likely to spontaneously disentangle when the baby moves in-utero. Type B Nuchal Cord: When the end of the umbilical cord connected to the placenta crosses under the end connected to the baby. This may be called a “locked” nuchal cord, and it is less likely to spontaneously disentangle. As previously mentioned, a nuchal cord may also contain single or multiple loops; multiple loops may pose a greater risk of fetal complications. Additionally, the risk of birth asphyxia depends on how tight or loose a nuchal cord is. If the cord is wound tighter, the risk of asphyxia may be greater. It is important to note that fetal movement can sometimes cause an initially loose nuchal cord to tighten (1). Hypoxic-ischemic encephalopathy (HIE): HIE is a neonatal brain injury caused by oxygen deprivation and limited blood flow to the baby’s brain at or near the time of birth (i.e. birth asphyxia). Some children with HIE develop disorders such as cerebral palsy, epilepsy, and intellectual/developmental disabilities. Intrauterine growth restriction (IUGR): Babies who are abnormally small are at higher risk for brain damage during the birthing process, and must be managed very carefully. Meconium in the amniotic fluid: If the baby takes their first bowel movement while still in utero, the meconium (stool) can pose a serious threat to their health. Unborn babies swallow amniotic fluid, and if this fluid contains meconium, it can cause a dangerous complication called meconium aspiration syndrome (MAS). Fetal heart rate abnormalities, which can increase the risk of operative delivery (use of tools like forceps and vacuum extractors). As the baby’s gestational age increases, so does the likelihood of a nuchal cord. Nuchal cords are often identified during an obstetrical ultrasound. To identify a nuchal cord, physicians look at multiple views of the fetal neck. A nuchal cord is diagnosed when the umbilical cord is seen encircling at least three-quarters of the fetal neck. At term, the sensitivity of ultrasound for detecting nuchal cords is about 70% for gray-scale imaging, and 83% – 97% with color Doppler (1). Usually, pregnant women do not experience any symptoms from a nuchal cord. If the nuchal cord is affecting the baby’s oxygenation, then the baby may begin to show signs of fetal distress such as an abnormal heart rate on the fetal monitor (1). The main goal in managing a nuchal cord is to prevent umbilical cord compression during delivery. Preserving an intact nuchal cord will depend on how tightly it is wrapped around the baby’s neck. A loose nuchal cord can usually be easily slipped over the baby’s head to decrease traction during delivery of the shoulders or body. If this is not possible due to tightness, there is a technique wherein the physician may be able to slip the cord over the infant’s shoulders and deliver the baby through the loop. If this is also not possible, the physician may use the somersault technique, which allows the shoulders and body to be born in a somersault, with the cord being unwrapped after the baby is delivered. In rare cases, other interventions, such as an emergency C-section, must be performed (1, 3). A delay in performing a necessary C-section can severely exacerbate the detrimental effects of hypoxia and ischemia and can lead to serious brain injury. The physician and medical team must be very knowledgeable and skilled at handling issues that arise during labor and delivery that can deprive the baby of blood and oxygen. The team must be able to act quickly. Failure to properly monitor and treat the mother and baby during pregnancy, labor, and delivery is medical negligence. Failure to follow standards of care and guidelines, and to act skillfully and quickly, also constitutes negligence. If this negligence leads to injury of the baby, it is medical malpractice. If you are seeking the help of an attorney after a nuchal cord was mismanaged, it is very important to choose a lawyer and firm that focus solely on birth injury cases. The attorneys at ABC Law Centers have over a century of joint legal experience handling cases involving dozens of different complications, injuries, and instances of medical malpractice related to obstetrics and neonatal care. Our attorneys and in-house medical staff determine the causes of our clients’ injuries, the prognoses of birth injured children, and areas of medical negligence. We consult closely with leading medical experts, forensic specialists, and life care-planning professionals to secure our clients’ future care and their parents’ peace of mind, knowing their child will be cared for, no matter what. Please reach out today to learn more. You pay nothing throughout the entire legal process unless we win your case. 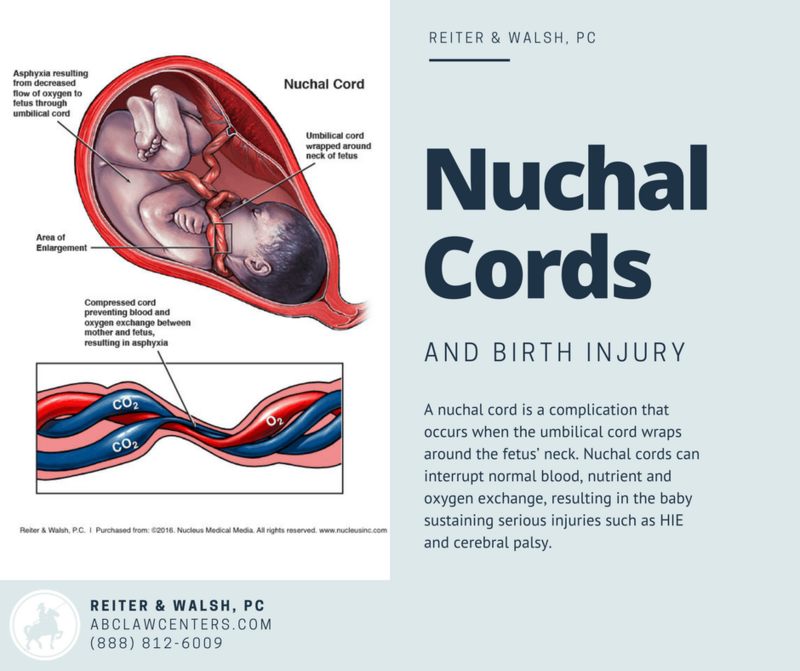 Watch nuchal cord attorneys Jesse Reiter and Rebecca Walsh discuss nuchal cords, hypoxic-ischemic encephalopathy (HIE), and birth asphyxia in this video. How do you pronounce nuchal cord? “Nuchal Cord: What You Should Know.” Healthline, Healthline Media, www.healthline.com/health/pregnancy/nuchal-cord. Barhum, Lana. “Nuchal Chord: Causes, Complications, and Management.” Medical News Today, MediLexicon International, www.medicalnewstoday.com/articles/319762.php.